1. Y Pantri Cymraeg (The Welsh Pantry) product. Bara Brith fruit cake. 4. Llaeth y Llan (Village dairy) Denbigh. Probiotic yoghurt. 5. Root’s jam & chutney. Ruthin. Jam. 6. Rhug Estate. Boiled sweets. 7. Roberts & son. butcher. Bala. Meat. 8. Crasdy’r Gader bakery. Dolgellau. Savoury pasty. 9. Cwrw Cader (Cader Ales) Dolgellau. Aur Cader (Golden Ale). 10. Eboni Ac Eifori Dolgelleu. Whiskey fudge. Machynlleth missing blog entry. cant remember what I took._thinking? 11. Organic, health store. Missing blog post until I dig name out. Aberystwyth. 12. Felin Ganol, watermill. Unique Stoneground flour 1kg. 13. Mangalitza by mail. Forest pig. Porkchops. 14. Hafod Cheese. Organic cheese. 15. 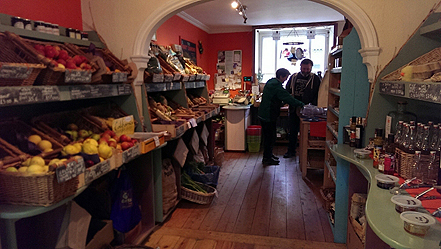 Carrot Crunchers organic and local produce shop. 16. Len & Mandy Walters. St.dogmaels. Fresh lobster. 17. Caws Canarth. Blue cheese. 18. Carmarthen Ham. Market trader. 19. Market trader. Tracing details..
A quick note to say I successfully finished the ride in Caernarfon Saturday 8th at 14.30 delivering a bottle of Waen Brewery Snickledodle beer to Y Pantri Cymraeg, on the main square Caernarfon. Thereby completing the circle I began on 23rd Oct having taken Bara Brith from them in the first instance. Becky remembers me setting off only 17 days before. More info will be forthcoming on these pages, once this food cyclist can gather his thoughts from such a grand and information rich tour. Some times the greatness of my journey is unclear to me. At a given moment this food cyclist is dealing so intentionally with the problem at hand that the wider picture isn’t in focus. Such was the case as I stumbled up the steps of The Royal Sportsman Hotel. Having been soaked to the skin from 11am till 5pm, sapped of my reserves of energy all I wanted was to get dry and warm. Tweed, the reader may not know, when wet has the ability to keep you from getting cold, unlike man-made fibres. This wearer’s experience is you are not actually warm, you are just not cold. The luxury of warmth & comfort only comes with a hot shower and a change of clothing. I arrived in Porthmadog wet through and began my search for accommodation. My schedule had changed & I had no clue I’d be in town that night. The Royal Sportsman in the centre of town has a bold & impressive silhouette. It stands like a boulder in its own ground, away from the nearby row of shops. I thougtht it unlikely I could afford such a private hotel on my meagre budget. And under normal circumstances that would be the case, however on enquiring if they had a budget single room Ian, the manager at the consiege desk saw my plight and took pity on this sodden cyclist and squeezed me in at a special price. Lickerdy-split like a water rat up a drainpipe I had Betsy’s basket off the bike and in the dry. Seldom has this food tourist had a better or more revitalizing hot shower in my room. As has been my experience during my Welsh adventure my wet woolens were peeled off and on this occassion hung in the boiler room. For gentle drying throughout the night. After a shower that lasted at least twice as long as it need to, warmed to my core, I checked Betsy had also checked in to her night’s rest in the cavenous boiler room. With time before dinner I went to explore such an interesting hotel. Grand from the late Victorian era the Royal Sportsman has a illustourous past, of shooting parties, walkers, climbers and industrialists. I was so lucky to snare one of the last rooms , as a large party of steam train enthusiasts were in town to celebrate a special run of the Ffestinjog mountain railway. The bar was abuzz with talk of steam and British engineering, both at home & overseas. The bar that night was a fabulous mix of diversity. 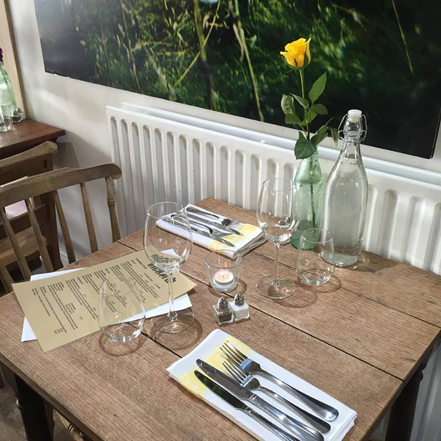 I surveyed the neighbouring tables; families come to dine at the bar, treating themselves to a holiday meal, The Royal Sportsman is rightly known for its excellent menu and use of local produce. Japanese students on holiday updating their profiles, pictured about to eat plates of stylishly presented Welsh fare. Across one wall a larger group of gentlemen of a certain age, several sporting mutton chops and waistcoats rumbunciously discussing the glory days of steam with numerous empty glasses of ales and a scattering of savory snacks. After an excellently conditioned pint of Purple Moose beer at pub (rather than Hotel) prices. I retired to sleep like a baby in my annex room. I woke to clear skies, dry tweeds and a truly superb breakfast. Of course I feasted on the breakfast of champions, scramble eggs with local smoked salmon and grainery bread, with copious fresh brewed coffee. However my greedy little eye, was very tempted by the fresh selection fruit platter, fresh danish-style pastries, or cerials. My stay at the Sportsman was brief but energizing. It was a genuine tonic and lifted my spirits after a wet & windy period cycling the byways. I set out with new purpose towards one of my own food heroes. Several years ago when I began to reasearch my journey and search out fascinating food produceres I heard of several fishermen who caught Salmon around the Cardigan Bay area by coracle. Coracles in Wales are a very ancient method of transport and more information & pictures can be seen here. Ken & Mandy Walthers run Cardigan Bay Fish Co and I visited them in St.Dogmaels. Thank you to Tom at the NEW IMAGE bike shop in Cardigan who stayed late after work to help me. He stripped down the rear hub, extract the broken threaded rod and fit a new one. His years of experience had it working better than ever. Cardigan and the surrounding area was a find to this rider. After some tough cycling and some poor weather the day before, my few hours in the town was great. After Vic North’s Cookery School it was a short journey to Caws Cenarth. That would be under normal circumstances …however the rain was falling heavily and foolishly I followed the roadsigns for the dairy. Unfortunately the place of interest brown signs take the vehicle drive around the hillside the long way. Missing out what I learnt later was nicknamed ‘the road of death’ anyway I was off the bike and pushing Betsy up a slippery road scattered with twigs and leaves. The wind was gusting I would think 25mph and the trees began to whistle. After an age I got to the dairy completely drenched. Carwyn Adams was surprised to see me in such weather, but there I was bold as brass. 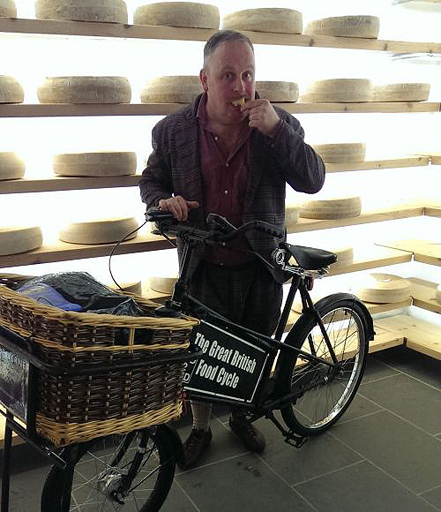 We immediately snapped a few pictures in the cheese store and tasting room. The pictures don’t show that if I stood still water run down my legs and flowed out of my shoes as I walked! I still had a few miles to go to find accomadation and the storm was worsening. Carwyn loaded me up with a few examples of their excellent cheeses. It was a terrible hardship, but I had to try a few nibbles too. This rider was offered cheese biscuits for later, but knowing the bumpy ride declined, as in an hour riding the rutted lanes I would have a wrapper with panko crumbs not biscuits. Leaving ladened with scrumptious cheese I laboured up the hill right in the face of the storm. Carwyn had called around local hotels and guest houses and found me a room at the luxury Emlyn Hotel. The difficulty was getting to it. I passed through a copse at the top of the rise and the wind ripped through the mixed woodland sounding more like heavy waves on a shingle beach. It was almost deafening. However my concentration was on the fine beam of light out front keeping me moving ahead. Missing potholes and twigs that could obstruct Betsy’s wheel. Then I heard dong! The telltail sound of a thorn in the tyre being caught & dragged out by the mudguard. I looked but couldn’t see a thing. And sure enough within a minute the front tyre was like a pancake. It was so miserable I pressed on and discovered I could cycle very slowly forward in first gear with a flat tyre. Result! I was only realising 3-4mph but better than 2mph walking in a filthy storm. I freewheeled down hill towards Newcastle Emlyn and made the four miles in about an hour. I was drenched and the evening staff at the hotel were great as I created a puddle in reception. They kindly whisked me off to my room and put a ‘caution -wet floor’ bollard up were the food cyclist had once stood. I certainly made my mark! Later after a hot shower and a change of dry, warm clothes I was ushered to the hotel boiler room to wring out, then hang my entire days’ clothes to dry in relative ease. What joy it was to have a Halloween inspired (spiced pumpkin) local pint, one of the hotels famous local steak pies with twice cooked chips & veg. Sitting back as the storm raged to watch my first tv for almost two weeks. 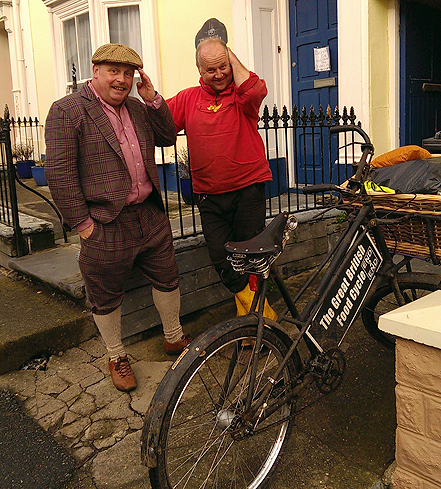 A chance meeting had the food cyclist visit with Vicky North famed baker in the Cardigan area. Set in spacious gardens Vicky runs a bakery school from what was the old vicarage set outside of the village of Abercych. If tou are at all interested in artisan baking in whatever form I strongly recommend this great location and small class sizes. A generous victorian kitchen gives participants plenty of room to hone their skills and space to make a mess if necessary. Vicky’s adroitness comes from her patience and competence to teach from the basic to the highly skilled. I arrived pretty much on time (which is very unusual) and was greeted with a hot cuppa, fresh croissant and good conversation. This hungry rider devoured her croissant with homemade preserves and after a polite pause swiftly moved on to bread & cheese. She providing oven fresh wholemeal and lucky me supplying a hunk of Hafod Organic cheddar. Perfect partners with Vic’s cherry chutney we sampled. Suitably replete I braved the heavy rain towards Caneath and well known organic cheese producer Caws Caneath. 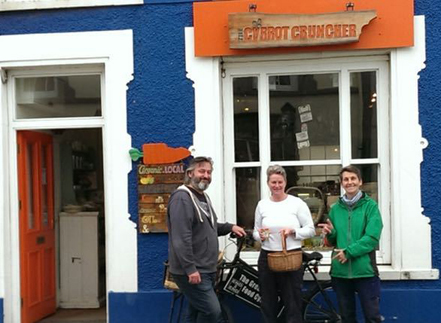 Carrot Crunchers on the High Street of Newcastle Emlyn is bursting with goodies. The proprietor Stuart graciously accepted my invitation to be involved as I cold called on my way through. The guys at Teifi Valley Railway (where I stopped for coffee & superb homemade carrot cake) had recommended veggie shops & delis in Emlyn. The vibe of the shop and the helpfulness of the owner is excellent. Local and seasonal vegetables. Larder provisions and special treats rubs shoulders with low & zero carbon goods. Bulk buy laundry liquids and Fairtrade products. A really well-rounded shop for this rural town. I also happened upon the fabled Lemon Curd fairy who was dropping off another batch of jars of scrumptious lemony goodness. (pictured center). Would give her name, but the town know her as the lemon curd lady! Lady luck had me also meet Phoenix (pictured in green) who was shopping at Crunchers, a eco shopper who insisted on buying me lunch (thank you) and helped me by dropping me & Betsy in Cardigan at the bike shop as my weary legs wouldn’t get me there by closing time with the tantalizing possibility of getting the gears working after 7 days of one gear! There are many players in the quality cheesemaking in Wales and two that shine out as being able to provide the market with consistent quantity and excellence of quality, born out it the flavour. In this diarists humble opinion they are Hafod organic cheeses and *Caws Canearth. *Caws is Welsh for cheese, you English heathen. 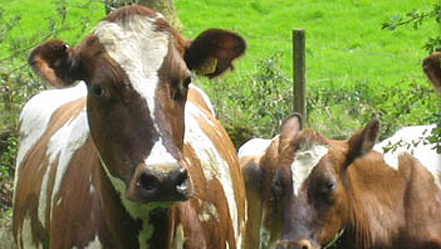 If you are in Wales and a cheese lover you almost definitely know these marqueues. Less so if you are in England or abroad. During this food cycle we have had many conversations with shop & deli owners, cheesemongers, people in the street & in the bars and pretty much universally people agree these producers hit the mark. Today I paid a brief visit to Holden Farm Dairy to swap cheese for cheese. Sam was unavailable however I meet worker Matt, a great guy and clearly passionate about food. While talking cheese we also got on to other foodstuffs and he gave me some invaluable leads to follow up later in my tour. Thank you Matt. I swapped Ty Mawr from The Buffalo Dairy for a hunk of Hafod’s finest organic cheddar. In two or three days time I should be climbing rhat darn hill to Caws Cenaerth for another swaparama with another good product, towards a hunk of dairy goodness with the same excellence of craft. Darn it cheese is superb in Wales. After a long and tiring cycle I made it to The Long Barn an independent hostel run 2 miles out of Llandysul on an Organic farm that is the backbone of Cambrian Organics. A company that produces its own lamb and beef burgers solely for festivals. They have such confidence in their product that they wound up their wholesale/retail sales to concentrate on direct sale at festivals. The Long Barn is fabulous- out of the way accommodation. You are in a barn. The clue is in the name. On a working farm. Everything works and it was a great experience at very affordable prices. It was worth the wait, for my trip to visit these little pigs. I have known about Stuart & Angela Mason for a couple of years and know that they are passionate about their porkers and are prolific in their dialogue online and offline about good food and integrity. The road up to their farm, Bryhelog outside of Llanddewi-Brefi is not for the fainthearted. On a good day you can see right across the valley. I’ve cycled down in the dark and the challenge of hairpins, wet leaves, water runoff, mud and high winds was, er ‘thrilling’ on Betsy. So in the morning i jumped at the chance of Stuart kindly coming to pick me up in the Landrover as my legs were rebelling after a hearty breakfast at the New Inn. I had been told on the QT that Angela likes a natter, but that is only half the story. Stuart is no shrinking violet and he too can talk the hind legs off, well a pig! 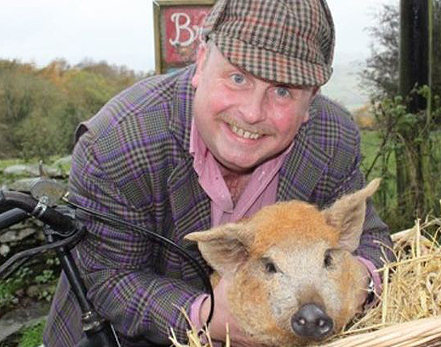 Get the pair on their favourite topic, mangalitza pigs (curly, ginger, forest pigs) and specifically how they have crafted their farm and the journey to build their herd & their business, and this food tourist just shut up and listened, and listened. 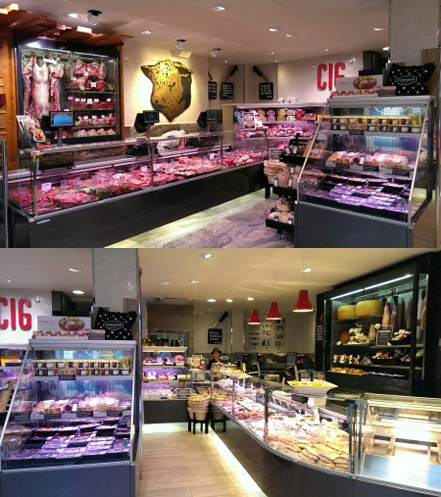 The farm supplies fresh or frozen meat direct or by post and is in the process of trialling other exciting charcuterie, prepared onsite by highly experienced chef Stuart Mason. A great find in the New Inn. It always feels great when one finds a hidden gem and I found a travellers rest in the New Inn LLanddewi Brefi, Tregaron. The morning before I had a made a casual agreement to meet with a couple to talk about their herd and with my miscommunication I was waiting on a hillside waiting to talk stock in the rain, while they were unable to receive my calls due to no signal in the valley. I lost the light after the clock changed a had to return to the valley floor to find accommodation. I cycled down off the highpoint from a very windy wet promontory. To find a local pub that had rooms available. Cycling in to a pub car park I put Betsy on her stand and let myself in from the courtyard the the surprize of the locals. I venture that it is almost unique that the The New Inn has had guests sporting matching tweed plus fours, & jacket with a cap over the top. Over the top is the word. As this writer found there was a pause for contemptation by the locals at the bar. To say this cyclist was a sight for sore eyes would be an understatement. I asked after lodgings and immediately after explaining my journey was taken in by the fabously band of locals holding court at the horseshoe bar. Through the evening I was treated to so many interesting and colourful stories of days gone by. Tales of local rogues, of golden days, triumph and tragedy. With a bar meal of excellent local steak and crispy proper chips from the expert hands of Yvonne Edwards the landlady for 22 years. Topped off by a couple of pints of local Teifi beer, drawn from m a tap room out the back I had found a traveller’s rest. To my delight The New Inn has splendid rooms, newly renovated to the highest standard. A new dining room filled with morning light, that can be converted into a space large enough for business presentations or for local clubs to meet. Breakfast was a knockout with delicious thick cut bacon, herby sausage, local eggs & with all the extras you could want. Reader, you can tell The New Inn hit this traveller’s sweet spot. Tell them Tim the mad cyclist sent you. 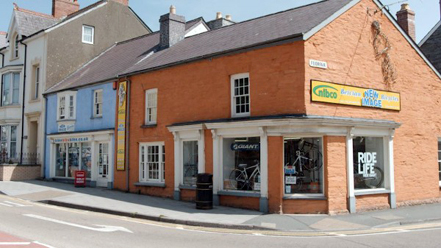 Dolgellau has been a goldmine of producers and has a thriving High Street and Square. A real sense of community and belonging. Shops nessle together and start to open around 07.30, like the baker, Crasdy’r Grader run by Trevor & Lisa Jane Humphreys. All the little doors creep open over the next hour or so and the hub is bustling by 9am. My port of call was Cwrw Cader (Cader Ales) situated just out of town in the industrial estate. 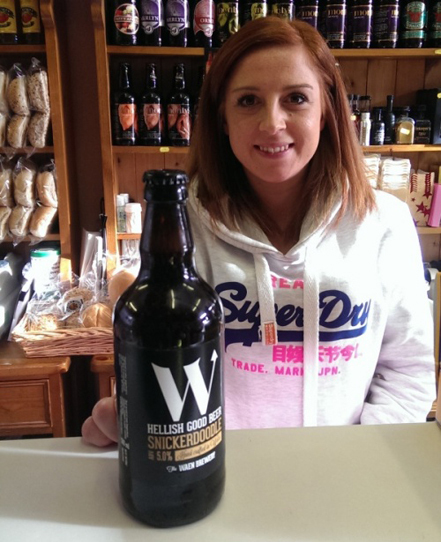 Owner and Brewer Stephen Warner received me and we soon did a swop beer for fudge. They actually go well together. I picked up their Aur Cader and a TPA, a classic Indian pale ale brewed in honour of the Talyllyn Steam Railway which runs in Southern Snowdonia. Amber sent n colour with a distinctive hoppiness. 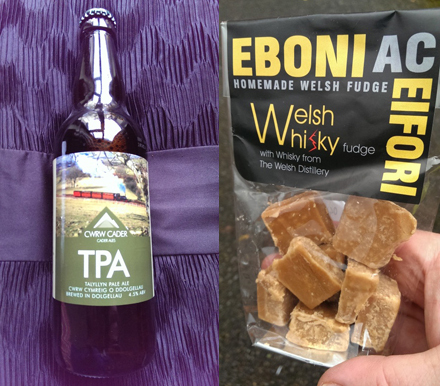 My swop was Eboni ac Eifori fudge a real success story on the edge of Snowdonia National Park. It is really important to set myself up to win. Cycling long distances everyday with a full pack and heavy bike takes its toll on my body. I take supplements to make sure my joints stay strong and muscles get additional nutrients. A hearty breakfast keeps me going and sometimes I can’t get my porridge oats with fruit & honey. 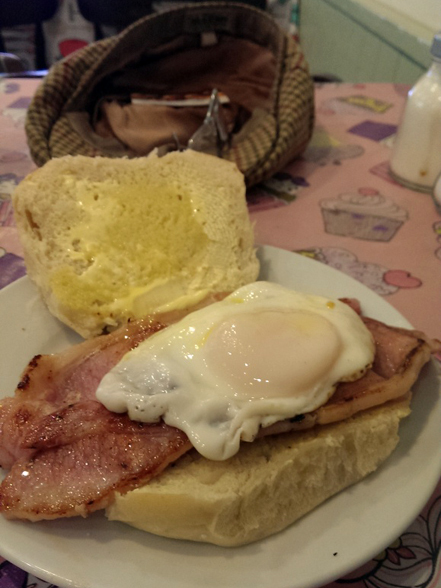 What I can be assured of is a breakfast bap in every town to line your boots with. 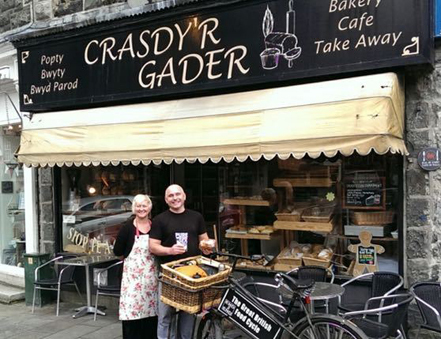 Crasdy’r Gader who can be found in central Dolgellau and online through their active Facebook page, serve up a great selection of breakfast goodies. My delight was bacon & egg on a white bap. With two double-thick rashers and a runny egg, on a fresh (baked that morning) roll. I’m very pleased to say the artisan breakfast bap is alive & well and feeding the workers of Wales. 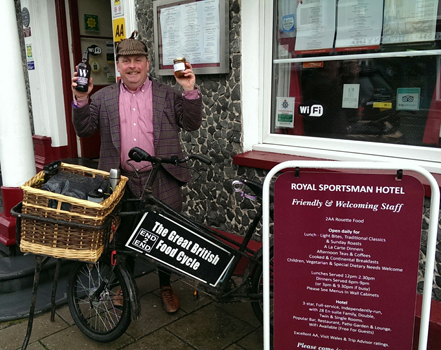 This food cyclist had an interesting cycle from Aberystwyth to Felin Ganol in the first instance. 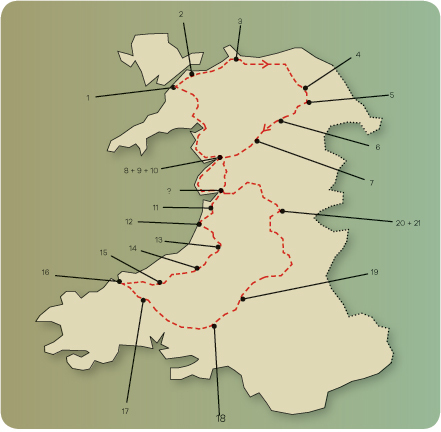 A really excellent cycle track hugs the coast then lifts up and over the highland and out and down to Llanrhystud. The route for cyclist down the coast is picturesque and fairly easy cycling. Felin Ganol is a fascinating story or rejuvenation. A watermill that had been used into the early part of the 20th Century and then frozen in time left to gather dust and slowly be swallow whole into the landscape. 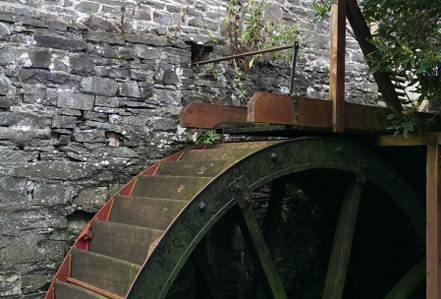 An attempt in the 1970s to renovate the mill to a working standard failed and according to Ann who runs the mill with her husband compounded some of the problems that were left for them to rectify. Smashed bearings, lost millstones and huge timbers and posts crumbling to dust are only some of the tribulations they have had to overcome. This traveller has only admiration for such a labour of love. It would shape ones life rather than the other way round. So many dozen new skills would have to be learnt before each part of such a huge project be undertaken. 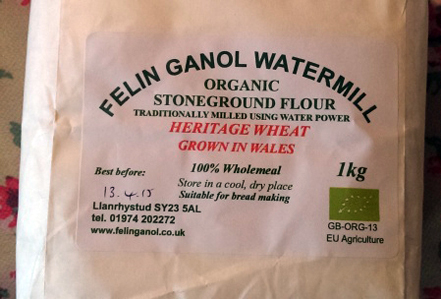 After rigorous testing and many tribulations the mill has been producing much needed local flour for artisan bakers and cooks for several years. Fortunately for this cyclist we had the opertunity to carry one of a very special new consignment of heritage wheat flour grown just down the road from the mill. Alas it didn’t stay in our basket more than a few hours as it was eagerly awaited by Angela at Mynydd Mawr Managalitza who were to be my destination the very next day. Well worth a visit to marvel at the technology and to purchase their fine quality flour for your home baking. The GBFCs journey is at a grassroots level and I love it as such. By traveling the roads and lanes we get to visit and meet many of the great producers who are just that- great artisans. They are often farmers, crofters or growers who have diversified to add value to their original product by first growing it then processing to a finish product which they have honed over time. They are not internet fluent, or social media savvy. Many don’t need to be as their products sell themselves at local markets and through small outlets. Perhaps they don’t have a web site or social media account. They are busy doing what they do best. Make delicious food, but to the wider market they are invisible. 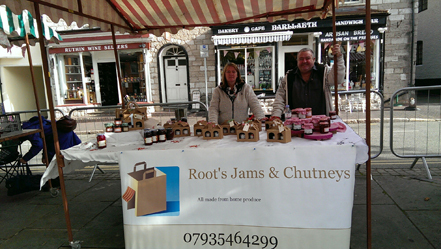 One such example is Roots Jams & Chutney at Ruthin Saturday market. A husband & wife team who make tiny batches of lovely preserves from literally homegrown fruit & vegetables. They have some unusual and interesting flavour combinations which including a really well made raspberry marmalade. As part of my journey I was able to make a swop of their marmalade with a manager within a company who’s wider remit is to supply the very best produce far across the country (and world) to top restaurants run by the chefs who we know simply by their first names from TV shows. 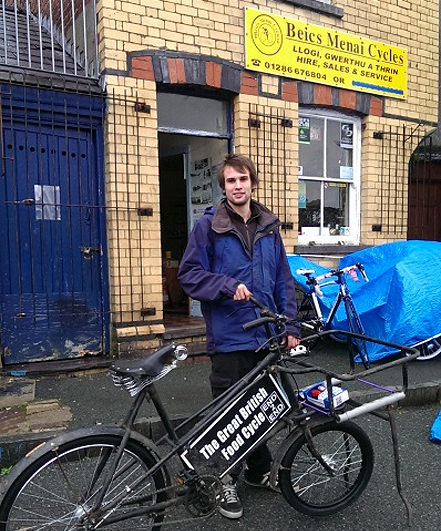 This food cyclist love’s it that he can make a difference and pass fine foods from one gourmond to another. The possibiblity of a kitchen table top business getting their product to the counter top of a famous fine dining restaraunt is wonderfully egalitarian. If the Roots marmalade hits the right taste note, in his palette who knows where it could lead for one small smallholder from Ruthin? 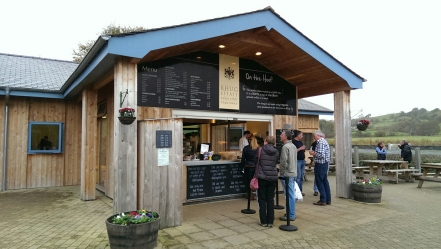 Rolling in to the car park at the Rhug Estate farm shop, restaurant & grill is not your average farm shop experience. The grill is wafting tantalizing smells of minute steak and prime burgers with liveried grill chefs preparing the orders in double-quick time. Even on a drizzly day when I visited there is a queue of people wanting hot food on-the-go. 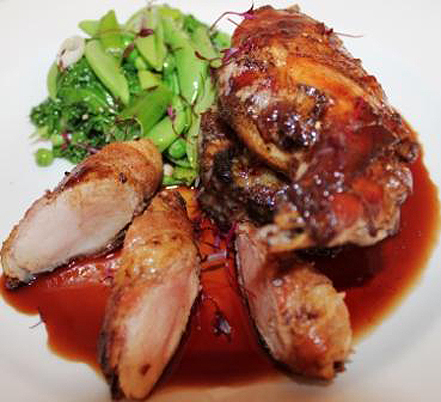 Mums with kids retirees and builder and tradesmen passing the venue know where to get great estate prepared grub. 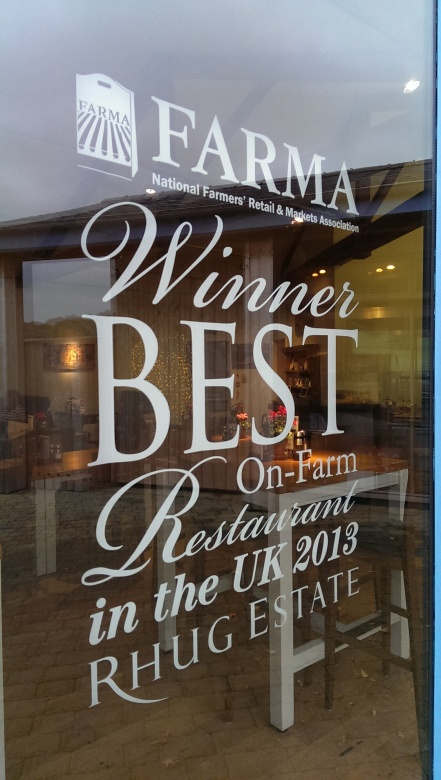 If you want to eat high on the hog, so to speak you can dine in the restaurant which comes with the highest accolade Best on farm restaurant in the UK 2013. I could see the many staff readying the shelves for the Christmas onslaught. With all manner of choice sweetmeats both sweet & savory and preserved goodies of every description. All of the highest calibre. The majority of suppliers are very local from down the road or across the valley. A very high percentage are Welsh, with a few supplied by neighbouring counties. Exotic items like olive oil is harvested exclusively for Rhug from a single estate. I can only image the cash registers having to be hosed down at night as they will be running hot from now until New Year. 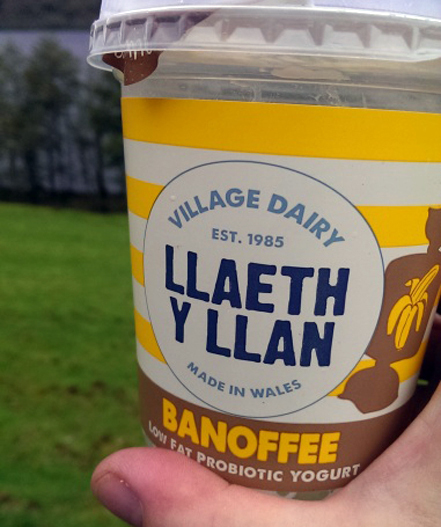 Llaeth y Llan (The Village Dairy) make lots of delicious dairy products but surely the best, as a pure luxury has to be banoffee probiotic yoghurt. I am a man of steel, who cycles the byways of Great Britain in rain or shine, on a bike with no gears, but my metal was tested by resisting such a yummy dessert. 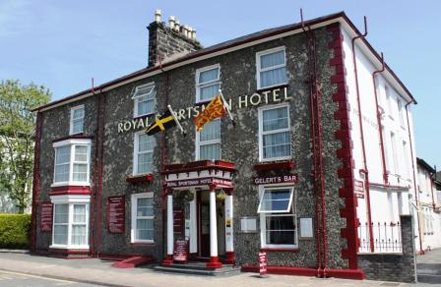 I stayed over at The Castle Hotel in Ruthin and an excellent service & accommodation it was. I highly recommend it. The staff both day and night went out of their way to furnish my every need. They found special parking for Betsy and organized fridge space for my foodstuffs in transit. To make sure my produce was kept in tip top condition ready for delivery at the next stop. A great hot shower & a good nights rest is a recipe for success. Breakfast was perfect -hot porriage with sliced banana and honey. A breakfast of champions. Spool foward many hours and getting in to Bala after a tough cycle against a 16mph wind and rain right in my face for 6hrs. Soaking wet and arriving in town in the dark & cold is not my best option. I needed a boost when I got to my nights rest on the High Street. Protein and carbs in an easily digested package….banoffee yoghurt was the complete package. Sorry everyone you’ll have to buy your own, because I scoffed it! A brief stop at Edwards of Conwy, famous butcher in the area to pick up one of their famous pies. I was given one of their Huntsmen pies. Which i was recommended to a day before by a cyclist near Bangor. I was told they are very popular at the nearby real ale pub The Albion. A chance meeting on the High Street of Menai Bridge had me sit & have a cuppa and delicious potato cakes with Claire Rolland, owner of Pumpkin Seed Bakery who opened six months ago. She shared that the whole of the local community has been very supportive to make the business a success. Pleased to see an artisan producer back on the high street. 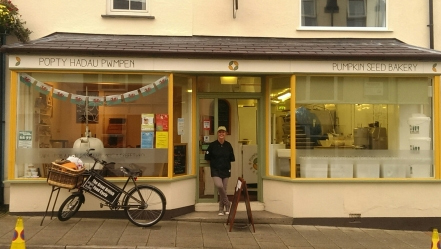 Popty Hadau Pwmpen (Pumpkin Seed Bakery) freshly bake regular loaves and specialist dark & light sourdoughs which are a special hit with overseas visitors. I quality tested the potato cakes (purely for research) and I can confirm they passed with flying colours! A member of the Real Bread Campaign Claire learned her trade travelling the world working for top bakeries in UK, Europe & USA. If you are on the Isle of Angelsea this weekend for the fun fair or visiting for a late holiday they will be open all weekend with some great baked treats. Claire also stocks homemade jams, jellies and local Angelsea honey. Well what a start to the journey I have had. Two punctures and a 3hr push into Caernarfon. I was exhausted. Up in the morning and thank you to Trotters independent hostel for such a warm welcome and help in finding someone to help fix the bike. Gary at Beic Menai Cycles was brilliant at fixing Betsy up to full strength. It was quite a dent in my schedule and I left the castle at lunchtime instead of early morning. I had a lot of time to make up..
After a silly mix up around my ticket to Bangor, North Wales I took a later train and found the staff at Euston incredibly helpful. 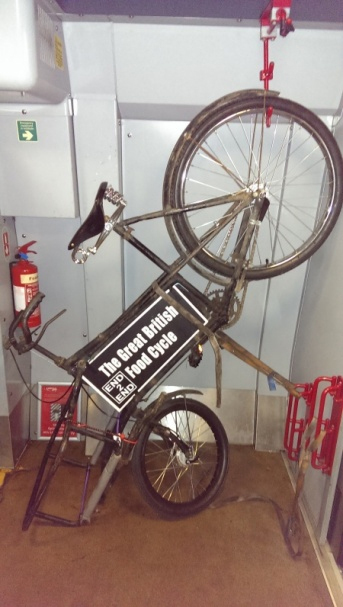 While waiting to resolve the issue I got talking with a lady staff member about Betsy as a butcher’s bike in the ticket hall at Euston is an unusual sight. She remembered when she was very small the baker delivering on her street bread and pastries on a similar bike. I got to board the train early as a huge wicker basket and rusty bike doesn’t mix well with business travellers. 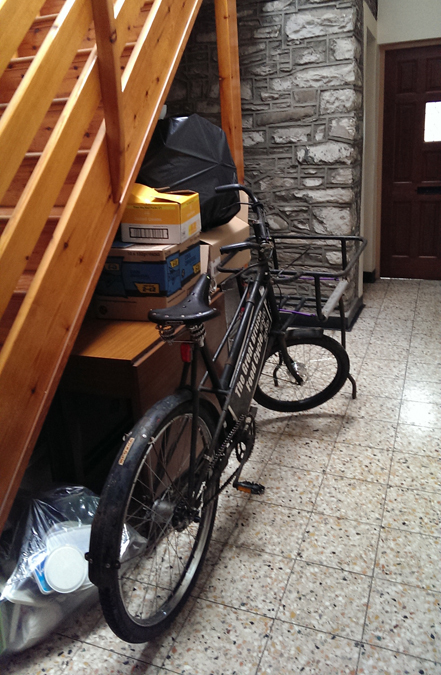 I found the bike storage area and after a couple of attempts worked out the best way to store Betsy! Fun and games changing at Chester for our final destination Bangor.